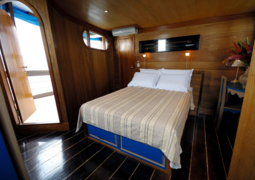 The Amazon Dream offers you a a distinctly Brazilian cruising experience through the Amazon. The traditional design and a range of itineraries offer a rich mix of natural history, wild beauty and relaxation for an ideal cruise. 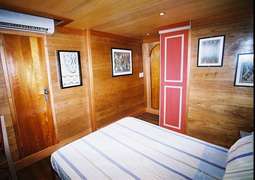 Cabins on board the Amazon Dream are designed in a distinctly Amazonian style, each with individual touches which make them easy to call your own for your time on board. Each cabin comes with all the amenities you need to enjoy your cruise and some of the cabins feature access to spacious balconies perfect for relaxing and enjoying the beautiful Amazonian views. The chef on board will prepare you an intimate meal prepared with freshly sourced and delicious ingredients with are used to make any number of local recipes. At the bar you will find staff who can whip up a fresh cocktail made with a range of fresh Amazonian fruit, perfect for enjoying out on the sun deck after a days adventure. A range of excursions will be organised in order to make your trip to the beautiful Amazon region as enriching as possible.